There is this one thing that even the gods envy about us. When man was created, the original inspiration of all arts was Nature. Even the latest steel and a sports marvel of a stadium is built on the inspirational model of a Bird’s Nest. So, all arts maybe collective paeans to the divine artist but there is still something that she/he could not quite figure out overtly or inertly when man was being chiseled in the last ladder of the species of the world. Food, Or the ‘artistic endeavor’ of cooking food. In the film, Autumn in New York, Richard Gere’s character tells Winona Ryder that ‘food is the only nourishing thing in the world.’ One cannot deny this truth and the fact is that of all the nourishment that is available or possible, food is the only tangible thing that we see with our own eyes and consume. It forms blood, energy, cells and so many things… I must confess, all my life I was vehemently against the concept of cooking being an art by itself. But the city of Shanghai changed that. Watering holes like 1221 and GOGA altered that belief. And two people named Michelle and Brad Turley indoctrinated me into the theism of food, (I am sure there is a non religious, uncertified cult like that…) and two lovely people that I know, also a married couple- Pooja and Girish changed my prejudice towards Chinese food and cuisine eternally for a life time. Life, despite being another four letter word, is also largely synonymous with surprise. Good, ugly, rude, earth shattering, irritating.. but the one thing that you keep never learn is that however much we may know but life has a way of throwing us off guard or catching us wayward- and we actually ask ourselves. ‘How much more knowledgeable am I after my last tryst with life? When you have actually told yourself that you have to live with this bitter truth each day, a butterfly comes and settles quietly on the embroidered flower on your blouse. Even it is disillusioned for a moment with the brilliant array of colors on the fabric, but it is a creature more in search of the real ‘essence’ and is again in search for the real deal. But ah! You behold the moment when that delicate powdery winged insect chose your shoulder. You are so taken up by the suddenness of that innocent moment that the grief that has been gnawing at your soul is taken aback by the audacity of that butterfly who can manage to distract your attention even though it is for a brief spell. I have also been completely sold to the thought and idea that food has to appeal to the imagination and for me the oriental cuisine, especially South East Asian, and zeroing it further, Chinese- had lost all battles on the food front. The real challenge is not when you cook with the most succulent of meats but when you cook with the always step motherly treated neglected vegetables. Throw another gauntlet. Vegetables cooked without garlic and onions. Here, it is wiser to think it as a convenient option to back out rather than graciously accept that you can’t achieve the unachievable. There is no pride to lose here. The situation is likened to that which states that one need not bring a cannon to kill a rat, but likewise one cannot also fire a rat from a cannon. But all that was destined to change some day for me. I believe in my beliefs and my beliefs told me this time that they needed a serious makeover. 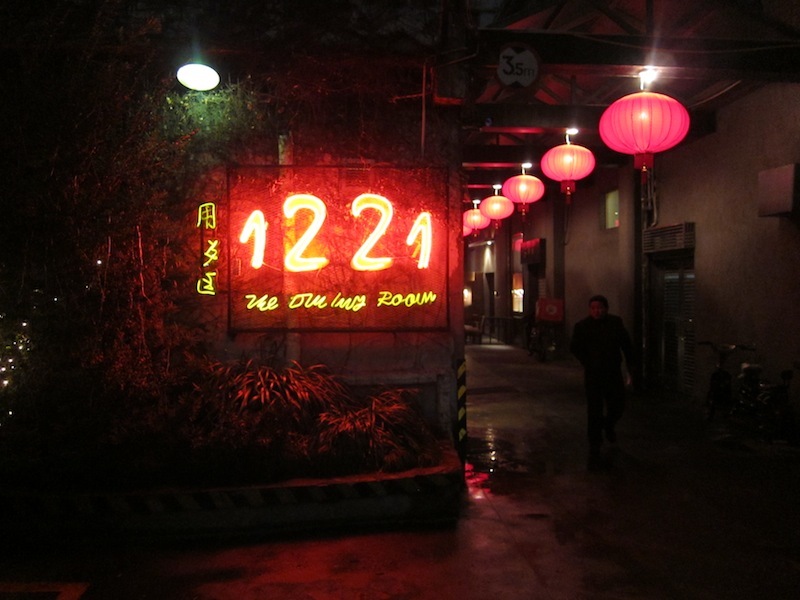 It just took 4 digits to bring down that entire edifice of supreme ignorance that ‘Chinese vegetarian food cannot be had in China.’ The restaurant was 1221 and the owner was Michelle. 1221 taught me a thing or two about life. Our personalities become our work. Michelle just keeps smiling. I met her the second time during our visit to 1221 and there was our grand woman who radiated warmth. The serving people in this place smiled and it lit our hopes that my notoriously renowned palette will not probably fight with every atom of the food particle eaten, only to be cruelly and painfully thrown out. The ambience has no frills, there is a glow to that place created by an orange light reflected and bouncing back on a glass frame. There are two rooms inside and largely whites occupy them. I actually saw a group of Yankees who had driven straight from the airport with their cabin luggage and laptops and executive ties loosened up to this magnificent dining space. 1221 has not more than 8-9 round tables. Again, a practical format for dining. Rectangular tables give conversations an edginess. There is very seldom that circle of energy flowing and permeating. These tables are circular and even in our case, we were four of us during our second sojourn to this heavenly place, we never felt the stiff, straight line like feeling while dining. We sat in a moonlike arch, two-thirds into construction, and the enthusiasm was unique. The quintessential nature of food is warmth, again that comes from the fact that it cooks over fire. I reassert the owner’s persona once more here who went from dining table to dining table and enquire, chatted, laughed in that infectious manner where the smile reached the tip of the eyes. The single malt for me though was when she came to our table and asked,’ You guys never drink, do you?’ It was asked with such clarity and yet there was a whispering note to it as in not wanting to be too privy. This is what makes an absolute class apart proprietor of a dining house memorable. She noticed, she remembered and she inquired. I must have had the weirdest cuisine in the Red Flag country including weeds, grass shoots, lily flowers, fungus and for an infamous palette like mine, I enjoyed every morsel. The Golden Gate of San Francisco has a tiny opening in a comfortable neighborhood in Shanghai city. Brad Turley is the name of a man who is responsible for the origins of the term, ‘culinary art’ actually. Huge in frame, Brad has a demeanor that makes him appear lackadaisical and kind at once. He does not make eye contact with you when you talk to him, but listen to the man speak. He will have wished you much after you have thought that he is not given to formalities. The man has three visiting cards that describe his eating joint. A disciple of the most famous chef in the world, Roy Yamaguchi does have the all the sensibility of someone who made cooking his way as a conversation with the divine forces above. No exaggeration this is. He is a connoisseur with concoctions and his fusion of the cl assical Japanese cooking with the ‘working too hard’ American recipes. 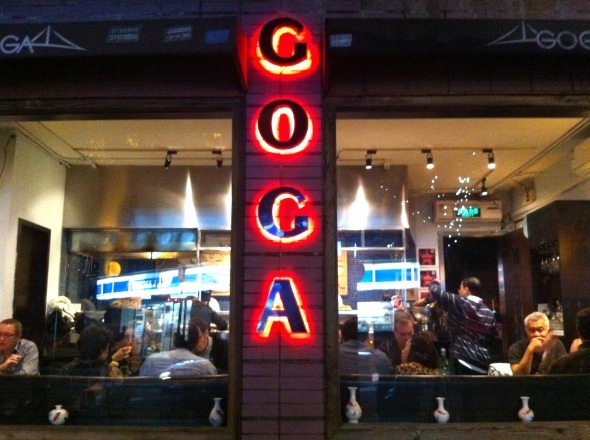 GOGA has signature dishes…u ate the San Fransisco China Town Salad (the asian influence one) Some of his delectable fare is the Cheese n bread salad with loads of olives n tomatoes and fries were truffle oil n cheese n pepper infused. Though we reached on time, his food was already over. He has an open kitchen and he has all the detachment of a mendicant to tell you that it is all over. But he will put something across. I was touched by that man’s humility. His love for food is so supreme and secured that he does not care that the open terrace restaurant upstairs has nothing visually appealing from the restaurant’s side. There is a tree whose boughs stretch to the street. There is a street corner and the orange penumbra of the streetlights bounce off the tar road on the small shops around. Mr.Turley also doesn’t even care that adjacent to his building is a hotel with exotic dining rooms with lush décor. I tell you that at one glimpse, this man comes across as too arrogant for his own good. But meet the man and eat his American vegetable salad and his pasta to know how much you misconstrued. The open kitchen in GOGA is a testimony that its soul is intact. The openness of the outdoors matches with the goodness of the staff who works there. They give you clear cut answers. It is either a firm “yes” or a “no” to a dish that they can procure for you. The humble tree outside is the only natural frill and compliment to the place. Like Michelle’s 1221 is set inside a street and she couldn’t care less if you have to pass by toilets to enter that formidable iron door, similarly Mr. Turley is that food mystic who has the respect of a tree camouflaging his place. No mean feat that is. Ambrosia is the term that refers to the idea of ‘food of the gods’. Does this mean that the gods have ordinary mortals as cooks or chefs in their kitchen? Probably so. And if he is from San Francisco, then a hugely powerful city beginning from the alphabet ‘S’ lost out hugely to another Oriental city this side of the globe also beginning from ‘S’. I like this site very much, Its a rattling nice post to read and find info. “Do not trust your memory it is a net full of holes the most beautiful prizes slip through it.” by Georges Duhamel.